Septic tanks are a long lasting and economical solution for the storage of sewage. These tanks are designed for durability and longevity. Fiberblass septic and waste water storage tanks are ideal due to their polyethylene properties which prevent corrosion, rust, and chemical degradation from soils and sewage gasses. Looking for a tank that is as light as plastic, but even stronger and more durable? 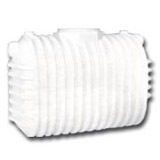 Check out our fiberglass septic tanks! We have models for both aboveground storage and underground storage of water and other liquids. Can’t find what you’re looking for? Give us a call and we’d be happy to assist!